I last sent a message at the very beginning of last July’s heat wave, when the rains of June were still fresh. 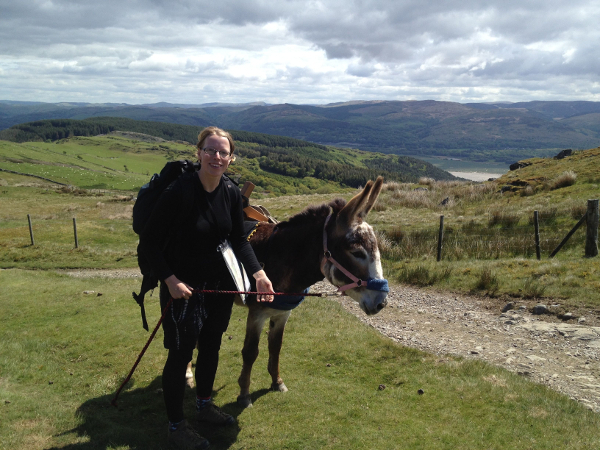 The walk around Wales took another four and a half months; Chico the donkey and I finally arrived back in Aberystwyth in mid-November, having completed the full 1000-mile circumnavigation of the country. We were very lucky. The adventure was dreamed up in 2012 during the wettest summer on record, and the organising all happened during last spring’s interminable coldness, when we all wondered whether the trees would ever get the chance to sprout leaves. I’d like to say it took faith, but actually I just tried not to think about it. After the heat wave which blazed right through July and half of August, we slow little travellers walked right on through a very mild September and October. There was rain, but never for more than a day, which meant that we always dried off before the next shower. November got tougher – the rain started falling with vigour, and it doesn’t take long to become quite mouldy and wretched. My shoelaces, less than a month old, rotted and snapped. Food supplies got wet, bread in particular soaking up the leaks. Usually I’d manage to find a phone box to refold my map in, but occasionally there was nothing. Those maps – north Pembrokeshire and south Ceredigion – are still wrinkled and rubbed, with place names ominously missing forever, like whole villages might have been washed into the gutter along with us. Chico, a hater of rain through and through, from his desert-dwelling genes to his unsuitably fuzzy, oil-less hair, had got so dependent on me that he’d often opt to stand in the rain where he could see me rather than take shelter. We were a sorry bunch. And yet I wouldn’t have changed it for anything. I was living outside, and rain is part of outside (and Nikwax helps!) I was walking around Wales, and rain is definitely part of this green isle. But most of all, the rain was a fine reminder to be flexible, and attempt to be relaxed with uncertainty. Climate change seems to be behind the extremes of weather, and that is scary. For the span of human history we have been creatures at the mercy of the elements, and now we are the ones with the power – it doesn’t sit easily. I think privileged humankind are suspended between feeling powerful and feeling powerless. Collectively people suddenly have the power to change the weather, but individually it’s hard not to see my shorter shower, diligent recycling or energy-saving light bulb as a tiny squeak of desperation in the roar of threatened existence. Individually we have the power to change how we live. So what to do? Do what you can, of course. Mend and reuse, buy less and recycle, ally yourself to brands and companies that you know care. Make changes that enrich your life, not ones that feel like sacrifice. And make friends with uncertainty. During the heat wave I had friends who flew to the Philippines, to Croatia and to Spain, for guaranteed sun on their understandably precious summer holidays. Meanwhile I basked and burned, day after day, in fantastic Welsh sunshine – absolutely not guaranteed and somehow all the more wonderful for it. When the rain began there were still all sorts of sensory treasures – the smells and sounds of storms, wild winds that Chico and I leaned into on Strumble Head, occasional rainbows, and fierce hailstorms on the tent at 3am. Make friends with uncertainty. Adventure stems from it, a donkey as a companion guarantees it! You need a resilient and resourceful attitude to cope with it, and that’s a thing well worth cultivating. And it looks to be the way the world is going. And then? Get out there, whatever the weather. See more Seaside donkey activity here: www.seasidedonkey.co.uk Like Hannah and Chico on Facebook here: www.facebook.com/seasidedonkey … and on Twitter at www.twitter.com/hannahengelkamp Hannah is currently working on the book and the film of the adventure, following a successful Kickstarter crowdfunding campaign. You can pre-order the book and film at www.seasidedonkey.co.uk/shop, or sign up to the newsletter to be kept informed of progress!